When you are in Ecuador it is not necessary to take travellers checks or loads of cash. You can do your Banking In Ecuador﻿ while you are there. Ecuador has many ATM machines all over the country. This type of convenience is typically only found in the larger towns and cities. Rural areas it will be hard to find an ATM so plan accordingly. Ecuador’s ATM’s use the Cirrus network. Look on the back of your card to see if it has the Cirrus logo. If it does, you may use your ATM card in Ecuador. You can check with your bank before you leave to see what the transaction fees will be. 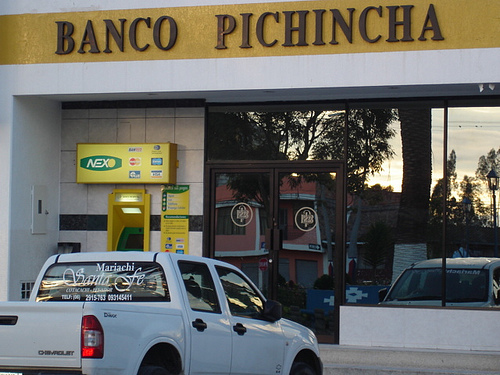 Many locals choose Banco Pichincha to do their banking in Ecudador. It is a very popular bank in Ecuador. There are a few other bigger banks such as Banco Guayaquil and Produbanco. They are all similar and offer many services. You will notice that bank lines can be very large and busy at certain times of the day and month. Many Ecuadorians pay for utility and other bills at the bank leading to long lines and wait times. Banking in Ecuador has not become an online activity yet for most as many Ecuadorians do not trust this type of transaction or don’t have access to the internet. So if you are visiting Ecuador as a tourist or planning to live there you can be assured that banking in Ecuador will not be a hassle for you to obtain cash while travelling and enjoying what Ecuador has to offer. Just remember don’t be frustrated if you see long lines. *Tip-* You can use the less popular banks as long as they have the Cirrus or Visa network. They are often not as busy, so you don’t have to stand in line so long.